In fact, marketers spent $238 billion in just the first six months of 2010, according to Nielsen. Why do companies spend so much on advertising? That’s a lot of loot. And, of course, marketers are spending that money to sell a product. However, they aren’t truly selling a product or service at all … they’re actually spending that money to drive customers to a landing page. In fact, according to Econsultancy, 65% of all UK print and television advertising now includes a Web address. Even when the ad don’t specifically include a URL, ad-inspired branded searches drive many customers to a website as the next logical point of contact. In other words, you’re spending a lot of dough to funnel traffic to your landing pages. 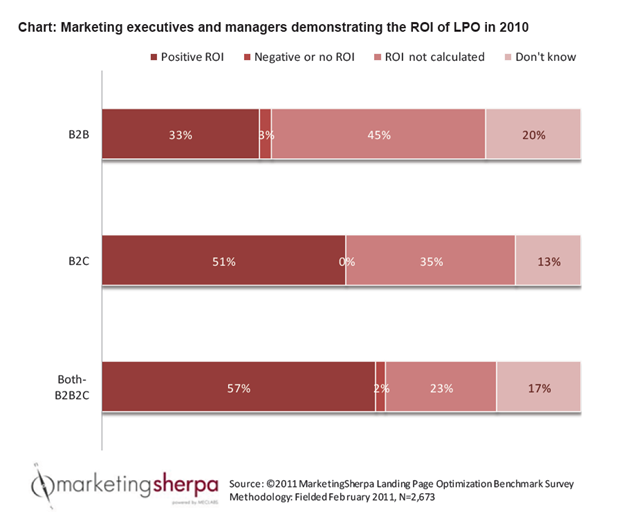 If you’re a long-time reader of the MarketingExperiments blog, you already know about the power of LPO and you might as well stop reading now because I’m not going to share anything new today (although, feel free to forward this post to your boss, colleagues, and mother to show the value of what you do every day). However, if you are looking to improve the performance of your marketing campaign and are not yet familiar with landing page optimization, I hope you’re starting to see why this practice can have such an impressive ROI. After all, the deeper into the funnel you improve performance, the bigger an impact it has. So what is landing page optimization exactly? Landing page optimization, or LPO, is just one term for the process I’m about to describe. You might also hear marketers discuss optimization, Web design or redesign, conversion optimization, conversion rate optimization (CRO), usability, or UX/UI. Step #1: Identify possible changes on your site that could improve the conversion of the traffic you’re paying good money to send to your website. Essentially, form a hypothesis about what you can change, and what you can learn from that change. Step #2: Test to see what you can learn from your audience. Unlike focus groups or surveys, valid tests will tell you with their real-world, real-time action if the changes you made helped improve conversion, had no effect, or decreased conversion. It’s important to note that you might hear marketers refer to this testing by many names as well, such as A/B testing, landing page testing, conversion rate testing, usability testing, split testing or UX/UI testing. Step #4: True LPO requires a testing-optimization cycle. You must continually repeat the above steps. One test, by its nature, only gives you a limited view into what your customers and prospective customers want. But continually testing and learning and improving is, essentially, what landing page optimization is, and it will help you, as the very definition of the word optimize implies, “get the most use out of” your entire marketing spend. If you’re new to landing page optimization, you might immediately see the value, but it can be a daunting task. And after all, you’re likely a very busy marketer with little time for new tasks. Keep in mind this one last upside. Not only will landing page optimization help you improve your marketing budget’s return, LPO will help you prove your value to your boss, your client, your CMO, your CEO, your board or anyone else you report to. You can start by taking a look at the MarketingExperiments website or signing up for our email list. We have a lot valuable, free information dedicated to landing page optimization and testing. Also, MarketingExperiments’ sister company, MarketingSherpa is currently holding a contest on its Facebook page that can help you with first step of the above process. Just “Like” the page for a chance to win a LPO session with a MarketingExperiments’ research analyst. In our case, it is kind of difficult to optimize for most of what we sell, except our training programs (we’ve just started those, so maybe LPO would fit for that). We mostly want to be highly visible and foster trust and reliability through our online presence, which will then make people want to call us so they can continue this relationship and become a client. It is a very long term marketing plan, which doesn’t quite fit with the landing page paradigm. We are a marketing agency so we have a few big clients and a spattering of smaller ones.